ASEES is a refereed journal which publishes scholarly articles, review articles and short reviews on all aspects of Slavonic and East European studies, in particular language, literature, history, political science, art and social science. We are currently accepting articles for Volume 33 (2019) which will appear towards the end of this year, 2019. An electronic copy (in Microsoft Word format) should be sent to the editor (robertjl@unimelb.edu.au) by 31 August 2019. Papers received after this time will not be considered for publication in Volume 33. PDF files of recent volumes are accessible from this page (see link below). ASEES is published once a year in a combined double issue; the current subscription price is AUD$35 p.a. including postage (plus GST $3.50 for Australian subscribers). Agents receive a 10% discount (AUD$31.50 (plus GST in Australia)). Individual subscribers to ASEES can pay by credit card for the forthcoming issue. Back issues (of most issues) of MSS and ASEES are available at AUD$20 per volume (AUD$22 including GST). Payment can be made by using the e-cart system (link above). Please note: all prices quoted on the e-cart page include GST which will not be included with your final payment if your address is outside Australia. Please contact the editor if you have any questions. Christian, R.F., 1962: Tolstoy's 'War and Peace': A Study, Oxford: The Clarendon Press. Kassow, Samuel, 1966: "Professional among university professors', in Balzer, Harley D. (ed. ), Russia's Missing Middle Class. The Professions in Russian History, Armonk, NJ: M.E.Sharpe, pp. 218-238. Sobolev, Olga, 2004: 'Boris Akunin and the rise of the Russian detective genre', Australian Slavonic and East European Studies, 18, 63-86. Contributors are referred to the current edition of the MHRA Style Book, London: Modern Humanities Research Association. 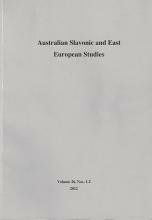 ASEES replaces Melbourne Slavonic Studies, founded in 1967 by the late Nina Christesen, which ceased publication with Volume 19, 1985. Back issues of most volumes are available for AUD$20.00 per issue (plus GST if in Australia). Previous volumes of ASEES are available online from the Miskin Hill website.